AP labour welfare fund is collected from every employee and employer from December month salary. The collected labour fund amount should be paid to the AP labour welfare board. In this post, we are going to learn how to pay labour welfare fund in Andhra Pradesh. The last date to make payment to labor welfare fund is January 30 of every year. In order to pay labour welfare fund in Andhra Pradesh, every employer need to make a list of employees and their contributions. After making this list. Employer needs to make payment to the following Andhra Bank account number A/C No: 142210011200206. This payment should be done in Andhra Banks only. But before making payment employer need to take Andhra bank challan in your nearest labour welfare office. Payment can be made through Cash, DD, and Cheques. When you pay cash you will get bank acknowledged challan immediately. Even if you pay through DD or Cheque of Andhra Bank also you will get acknowledged challan immediately. But when you make payment through cheques and DDs of other banks then you have to wait untill the amount transferred to AP labour welfare fund. It may take Two to Three days. Once your amount gets transferred then bank provides you the acknowledged challan. DDs and Cheques should be prepared on the name Welfare Commissioner, AP Labour Welfare Department. Till now there is no online payment system to make the contribution to AP labour welfare fund in Andhra Pradesh. Generally, this challan contains 3 copies ( sometimes 4 copies) one copy for the bank, one copy for remitter (sometimes Two copies) and one copy for Labour Welfare Fund Office. 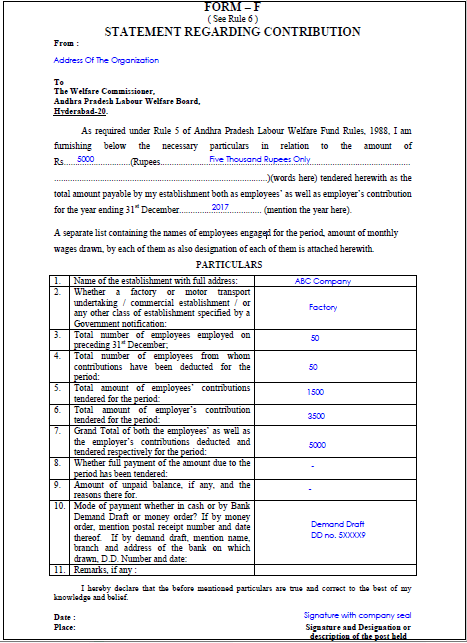 So employer needs to submit labour welfare office copy to their respective labour welfare fund office along with Form F.
So employer needs to submit Form F, employees list and Challan receipt to the respective labour office and take an acknowledgment from them and keep all those copies in office file for future reference. So this is the complete process to pay labour welfare fund Andhrapradesh. Lalour Licence taken for 3 years and valid up to 2021. Is it required to pay Welfarefund on early basis. Yes, You need to pay it on yearly basis.